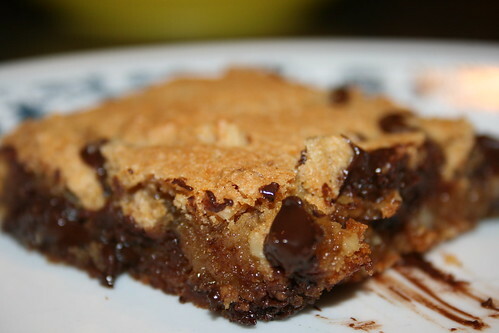 Toll House chocolate-chip cookie bars were a childhood favorite that I have not been able to veganize successfully until recently. The below recipe took a few attempts to get right, and I am really happy with the results. and mix until well incorporated and creamy. Variation: You can replace the margarine with an equal amount of canola oil. You can also use 1/2 cup brown rice syrup and omit the agave nectar. Scrape the dough into a lightly oiled 9x13-inch pan. 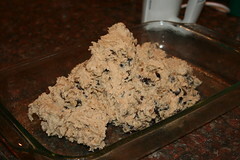 Spread the dough so that it is evenly distributed across the surface of the pan. Bake at 325 degrees Fahrenheit for 50-55 minutes. 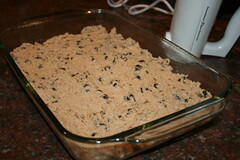 The cookie bars will be pretty gooey just out of the oven, but will solidify as they cool. Is there nothing that chocolate chips can't make delicious? ?